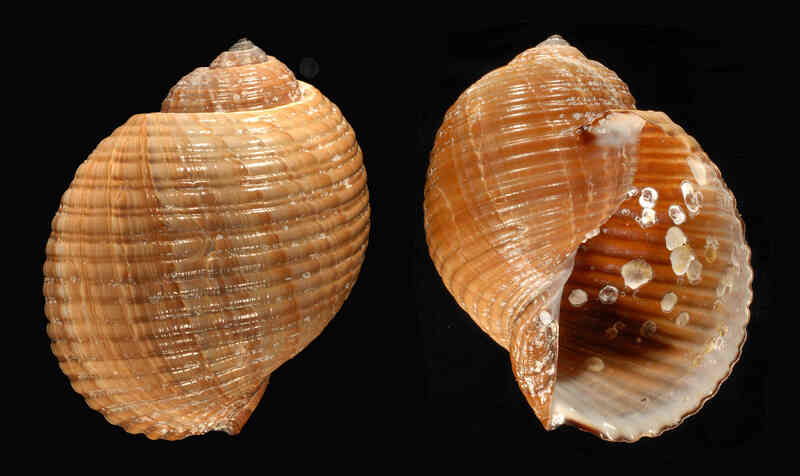 Shell size to 150 mm; shell globose, last whorl expanded, short spire. 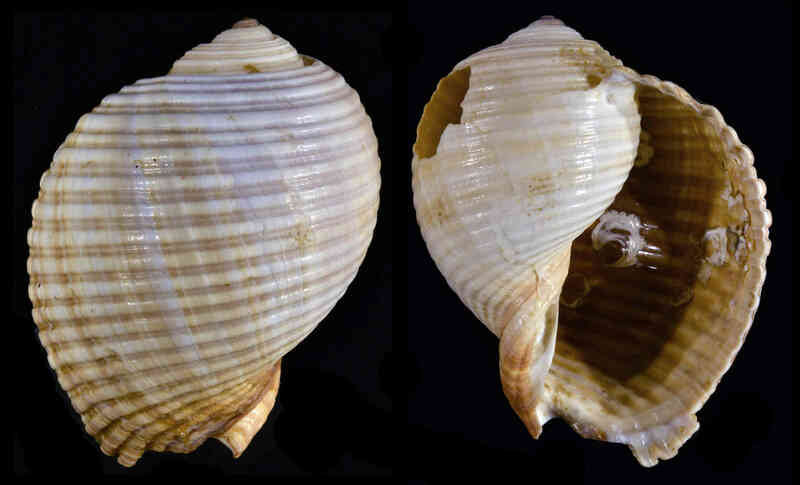 The giant tun, Tonna galea (Linnaeus, 1758) is a large gastropod, with a globose shell, short spire, and ornamented with around 20 spiral, strong but flat ridges. A thin shell wall allows ridges to show on its internal surface. The giant tun has a broad distribution in tropical and subtropical areas of the world’s ocean. The species includes a long-lasting, free-living (planktonic) larval stage that allows dispersal via currents over large oceanic expanses. Giant tuns feed on sea cucumbers, sea stars, and sea urchins, using a feeding apparatus that includes a pair of jaws and acidic saliva containing sulfuric acid. Although pieces of shells sometimes wash ashore on Sanibel, this illustration represents the first local record of a whole shell, found on December 20, 2009 by Rob Meyer in shallow water at the eastern end of the island. Young oysters were living inside the shell when Mr. Meyer first found it. The supplementary image represents a shell found by Ellie Hayward found in the water, off West Gulf Drive on Sanibel in early 2016. That is a worn shell that further confirms the sporadic occurrence of the species locally.